Jean-Claude Balek’s e-mail signature is followed by his job title: Culinary Engineer/Locavore at Palantir Technologies. Palantir is a Silicon Valley software company that develops tools to organize massive amounts of data. “We solve the technical problems, so (our clients) can solve the human ones.” And like any respectable Silicon Valley start-up, they also feed their employees well. That’s where Jean-Claude comes in. I met Jean-Claude (or JC, as he is sometimes called) recently at a book signing for our mutual friend Douglas Gayeton in Berkeley. We are both featured in Gayeton’s new book: Local: The New Face of Food and Farming in America. Gayeton’s book profiles pioneers in the booming local food movement and defines the words we use to describe our work. Words that to many of us in the local food movement seem obvious, but need defining if we are to effectively communicate our missions. Words like “permaculture,” “grassfed,” and “biochar.” JC is featured not only for his commitment to providing the employees at Palantir with locally sourced, fresh meals, but for the eight tattoos across his fingers that read: Locavore. 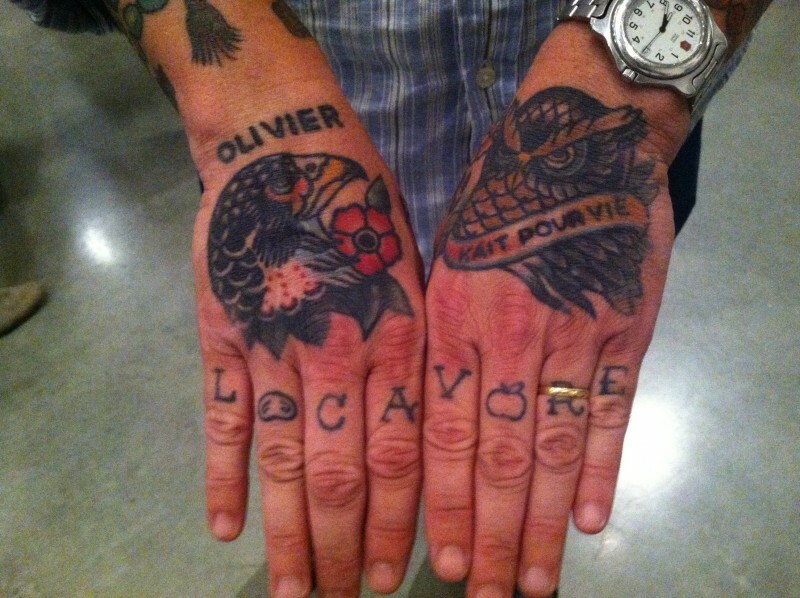 JC’s hands are beautifully photographed to accompany the pages defining “locavore.” The term was coined by his fellow Bay Area chef Jessica Prentice and chosen in 2007 as the Oxford English Dictionary’s Word of the Year. “The beauty of a local food system” Prentice says in the book, “is that it brings you back into a relationship with the source of your food, with the land, the animals, the plants, the farmers, and with each other.” Amen. JC and got to talking and I learned we both grew up in San Francisco’s Sunset District and ended up in careers that promote and create healthy food. JC worked for years as a restaurant chef, enduring the long hours and little recognition so many chefs do. At Palantir, the hours are sane and his talents are celebrated. He sources as many ingredients as possible from farmers and ranchers in the San Francisco Bay Area. Balek joins hundreds of other Bay Area locavores who are eager to learn the story of how their food is produced. At the beginning of his book Gayeton urges his readers to read it and then give it away so others can learn the language. “The intent of this book is simple,” he writes. “Seduce people with quirky collages and folksy handwritten notes that quietly introduce the tools to fix our crappy food system. The more people read, the more they’ll remember. Ideas can be powerful like that.” Powerful indeed. Now I’m going to get reading so I can give the book away.